I was playing a gig at a local place here in Rockland ME. On this particular gig, I opted to use my ’66 Ludwig Super Classic kit. (Here’s some vintage drum knowledge for you.) 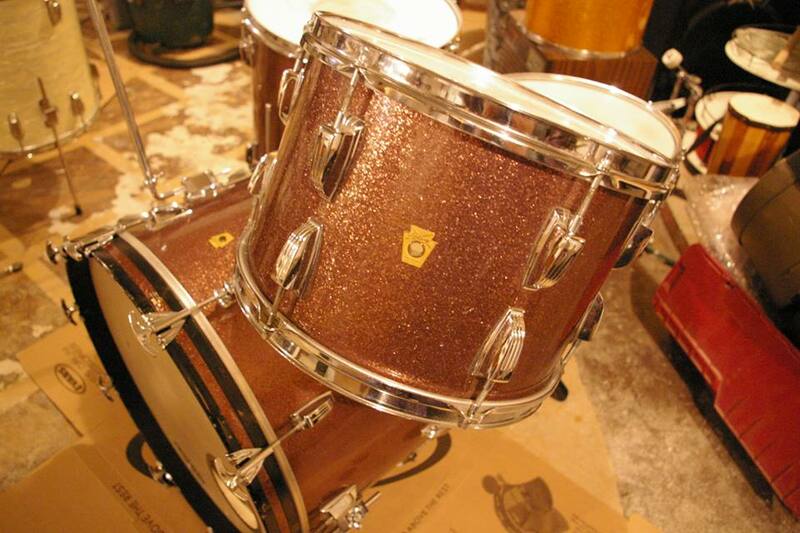 Burgundy Sparkle was only available for 3-4 years, from about ’66 to ’69, with maybe some spill over on either side. Usually, you could count on Burgundy Sparkle being dated somewhere in those years. The Super Classic is a designation Ludwig used for a 22″ bass drum with a 13″ tom tom and a 16″ floor tom. This particular drum kit is everything one would want to see in a Super Classic; matching “keystone” badges, rail consolette tom mounts, “baseball bat” mufflers, and white painted interiors. It’s just a regular, unmolested, honest Ludwig drum kit in somewhat rare finish. So anyway, on my break, I head to the bar for coffee (my usual drink of choice), and there’s a guy sitting there, regular looking guy, and he says to me “That’s a pretty interesting Ludwig kit you’ve got there. Is it vintage?” So of course I drum geek out on him, and tell him all about it. I ask him if he plays, and he says that he does. He then says to me “I also noticed your grip; you must’ve studied somewhere.” And so I recount how I was a music major for a little while at UMA, and at the time I was there the jazz program was highly regarded, and it was known as the jazz school you went to if you couldn’t afford Berklee. And I said, not a little smugly, “I studied with Steve Grover.” I looks at me quizzically. I inform him that Steve is the jazz cat to call for drums in ME. So this part gets a little hazy. After this little bit of bragging on my part, the guy I’m talking to mentions his name; it’s Tom Oldakowski. Then Tom drops this other little bomb on me: he’s the drummer for Radio City Music Hall. Over the last year, Tom and I have hung out a few times. When he’s in the area, we have lunch, talk drums, catch a local act, or whatever. And his aquaintance has really inspired me. As we talked that night, I told him that my hand work stinks. And it does. He, very kindly (everything he says is very kind), said he thought my hands looked good. They don’t. He’s being a gentleman. But meeting him has made me work on my hands. I’m actually practicing, not just playing drums along with some music on the stereo. And it’s because of a chance meeting in the little town where I live, where a big fish in a big pond let the big fish in the little pond know… Hey, you’ve got work to do.